When you click on one of the sections in the navigation menu on the left you will be shown that section's main page. When you have finished viewing that page, look back in the left-hand menu to see if other items are available in that section. 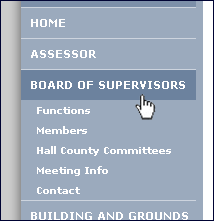 In this case, we click on the "Board of Supervisors" section and find that there are sub-sections for Functions, Members, etc. If you click on one of the sub-sections you will be shown that page. Keep returning to the left-hand menu to see if there are additional sub-sections to visit. 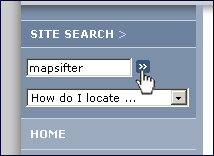 You can use the search function to find what you are looking for. 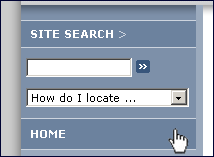 To search, simply enter what you are looking for in the "SITE SEARCH:" dialog box and click on the button to the right of that dialog box. All pages matching your search criteria will be shown, you can click one of the pages found to view that page. You can return to the front ("home") page by clicking on the "HOME" button in the navigation menu to the left. You can also return to the front ("home") page by clicking anywhere on the graphic at the top of the page. We want you to find what you are looking for at this site, if after searching by the methods shown above you cannot find a resource at this site please contact the Information Technology Department at (308) 385-5629.